Well with ongoing car issues I will not get into but the problem is too stressful to comment, mail came and made me smile when I really needed it. 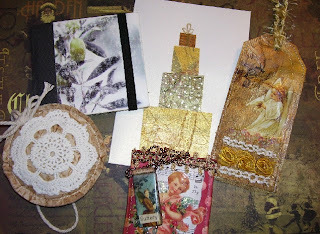 I was in an ornament swap over in our FlickR group and I was matched up with Jenxo and Jenny. Jenny was a little late signing up so I swapped with her as well. Both live in Australia and I got Jenxo's a few days ago and Jenny's arrived today. I can't wait to show you....in the ornament swap you had to use paper on your ornie. So of course this could mean a lot of things as long as it is an ornament and has paper on it, made of paper or whatever. This is what Jenxo sent me. 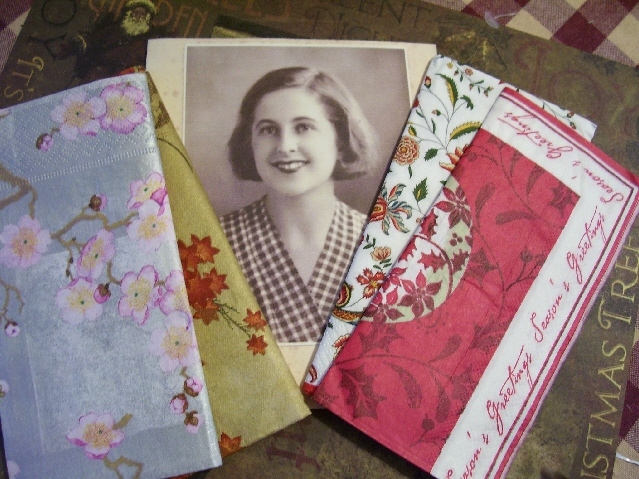 There is a little book that she sanded some outside of a cardboard box, looks like it had olives and greenery on it then sewed the little pages in, did some binding and there is elastic that wraps around the book to close it. 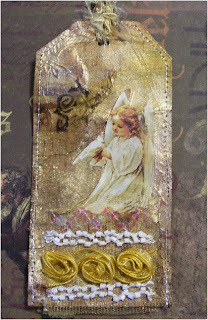 Below it is a doily that has been sewn onto sewing tissue then some string tied in a bow at the top to hang it. A beautiful stack of presents made out of different papers... How cute. 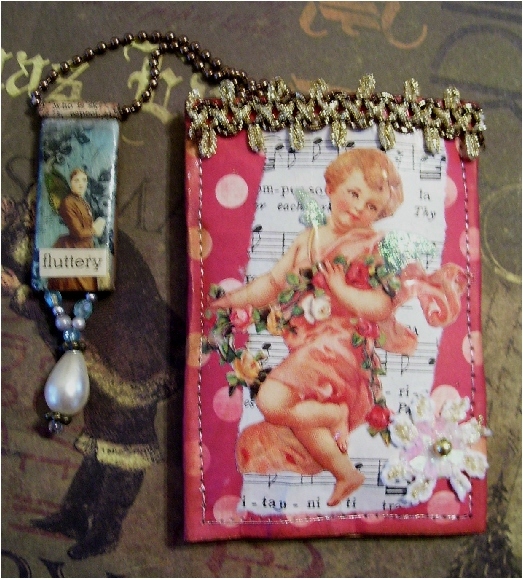 A little ATC pouch she made and it was stapled at the top. I heard something rattling but I thought it was supposed to rattle then I realized it felt like something solid in there. To my surprise I found a bamboo tile necklace with a beautiful paper bead and pearl drop on the bottom. I have already worn it Jenxo and compliments galore. 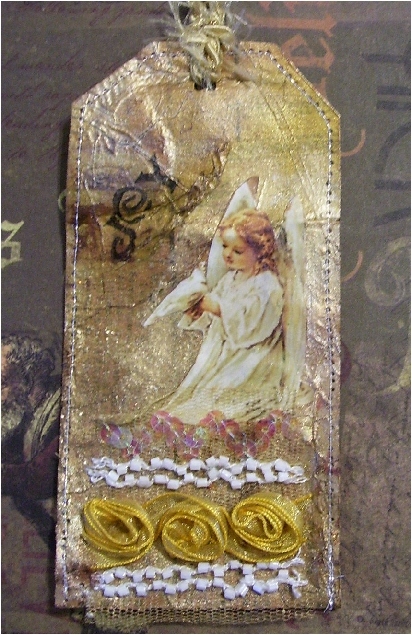 And this beautiful Angelic tag she made.Beads and lace and ribbon roses. It is hanging on a corner cabinet knob in my LR. Jenny made me these arches. 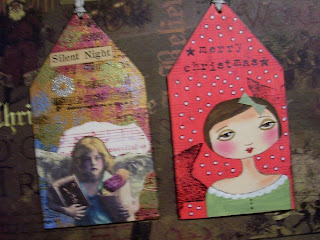 The Silent Night is gorgeous music paper with gold either ink or some rub on with some other lovely colours blended softly and the Merry Christmas arch is Jenny's whimsical girl she painted. She sure made me smile . Jenny also sent me some lovely napkins and this gorgeous card with a lovely message inside. Thanks so much Jenxo and Jenny and I wish you a Very Merry Christmas and Happy 2012. Your ornies are hanging around with other friends ornies I have collected over the years. I am so grateful for all your friendships. so glad you liked it all les, the olive book is from a kleenex box . i do believe you introduced me to that technique of sanding tissue boxes :) glad youlike and teh bamboo tile necklace and teh card and tag are made from fabric paper using muslin. You girls are sooooo clever!!! Tissue box hey!